I'm kicking us off today with something very quick and simple you can make for the festive season – a quick and simple key fobs tutorial. There are so many pretty ribbons available in so many designs, that if you want to make these on a specific theme you can do. 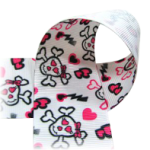 How about for sports fans, cat lovers or coffee addicts – you can find a ribbon to suit them all. Take a look at the video to see how easy it is. Send us your samples and we will be happy to publish them here with your credits, of course. I love this fast and easy project. This will be something I can make for my sons’ teachers. I am going to make scarves and maybe some hats. Cute key fobs. I’ll be working on some zipper pouches for gifts. Thanks for this tutorial and chance to win! I am hoping to make a festive table runner and placemats this year. Every holiday, I sew little drawstring bags and fill them with sweets for my sweet nieces and nephews. I’m more of a knitter/crocheter fiber artist, but I have a sewing machine & I’m always looking for quick & easy gift ideas. I just bought a stack of scrap fabric, having no idea what I was going to do with it but the fabric was just so cute! So thanks – even with my basic sewing skills I think I can manage this. Thanksgiving themed Yarmulke for my husband. Hanakkuh is on Thanksgiving this uear! Such a rad sewing series! Looking forward to more posts. I plan on making these key fobs. I’m ALWAYS looking for keys in my purse and this would help. 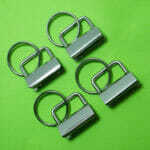 Looking forward to trying these key fobs, also been making Snowflake Ornaments. Just finished a couple LiL Twister pattens, a Halloween spider and a couple 2 color tablerunners. I don’t have plans to sew anything this year, but am knitting some scarves….and I think I’ll have to make some key fobs too. 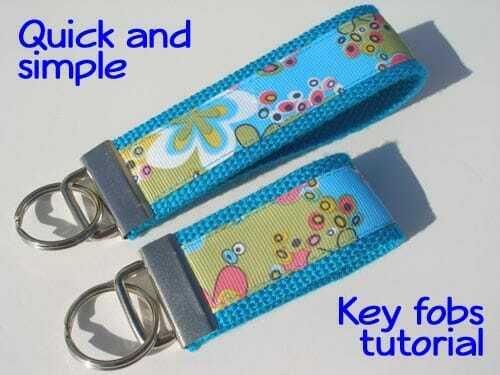 These key fobs are great and a great giveaway too. Opps…I meant to say…these ARE really sweet. Being in a new home (after divorce) and now with the love of my life, I’m busy trying to get everything ready for the holidays, ornaments, tree skirt, stockings, etc. I’m also wanting to make some cute embellished t-shirts/onesies for my grandkids. I would like to sew a tree skirt. I think these keys fobs are really ingenious. I plan on sewing some purses for gifts this year. The key fobs are really cute! This year some of the gifts will be purses and bags sewn by me. Thanks for the giveaway! I’m going to make some of the key fobs for my family to put in their stockings. I love that they are quick, so I’m sure to be able to fit them in between my many other projects. Thanks for the tutorial. Super cute and easy too. I have often wanted to try a Sewaholic pattern also.